For our resolution test, we reset the camera to its default settings and then used the highest resolution and quality setting. The camera was then set to +2.0 E.V. For more information, refer to our Testing Procedures page. 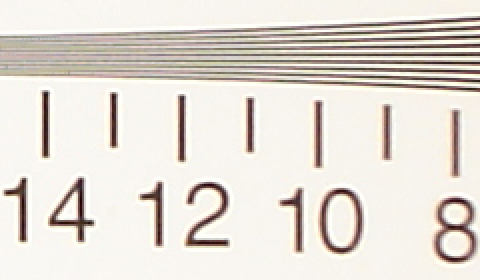 When reading this chart, the numbers represent lines per picture height (LPH). For example, the number 15 would represent 1,500 LPH. Below are 200% crops of the test. Click on a crop to see the full chart at 100%. 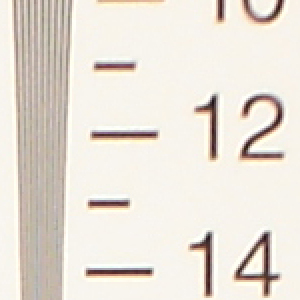 In the horizontal comparison crops above, the L1 shows just a touch higher resolution performance than the Olympus Stylus Verve. The L1 is able to resolve lines out to 1,200 LPH before moving to extinction around 1,600 LPH. 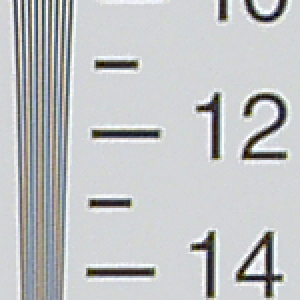 However, in the vertical crop, the Verve slightly outperforms the L1. The Sony L1 is only able to resolve out to 1,100 LPH before moving to extinction by 1,500 LPH. One of the most noticeable differences between these cameras is their default levels of sharpness and contrast. 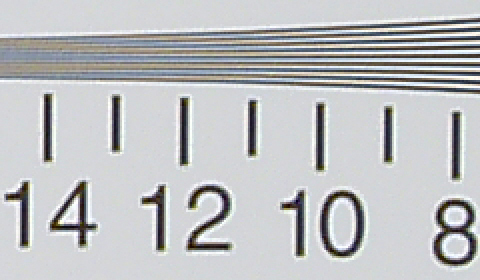 The Verve has higher contrast and higher compression, which results in the visibility of JPEG artifacts. The Sony L1 produces softer results with no JPEG artifacts. However, we should also point out the significant blurring towards the edges of the frame on the L1 resolution chart.